Liam O'Donnell's follow-up to the Brothers Strause' original alien invasion film, Skyline, may not have a release date yet, but that's not stopping the publicity train from trying to drum up some buzz. The latest poster for the flick has landed. Featuring a cool space opera vibe, it features stars Frank Grillo and Bojana Novakovic and a good look at the aliens. Taking place at the same time as the events of the first film, Frank Grillo plays a tough-as-nails detective who embarks on a relentless pursuit to free his son from a nightmarish alien warship. Beyond Skyline stars Frank Grillo (The Purge: Anarchy), Bojana Novakovic (Drag Me to Hell), Jonny Weston (Project Almanac), Iko Uwais (The Raid), Callan Mulvey, Antonio Fargas, Pamelyn Chee, Yayan Ruhian (The Raid), Jacob Vargas, Valentine Payen, Betty Gabriel, Jack Chausse, and Kevin O'Donnell. 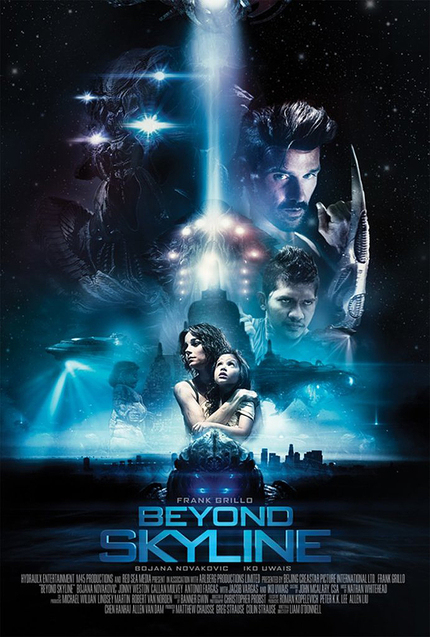 Check out the first clip from Beyond Skyline below. That alien design looks like one of the much ridiculed Ceph aliens from the PC game Crysis. Would love to see a movie with Iko Uwais and Frank Grillo rampaging across the screen in nanosuits. It sure is cool to see Iko and Yayan doing their thing in a different kind of movie. I'd much prefer to see them in wild genre pictures like this than more conventional crime and martial arts plots. With all of these elements in play (from the description and clip), this movie looks like it might be consistently as crazy as the first one was only in bursts. So this online work was it hacking or the creation of false news? Don't feed spam to the trolls please. This is an excellent example of how not to shoot a martial arts scene. Choreography and screen presence mean nothing if its framed wrong. There's no weight to anything. The geography is murky. Characters are secondary to the energy of the fight itself. Jackie Chan did a great interview about this once, comparing (less than exemplary) modern directors and cinematographers to crew from his own golden era in Hong Kong. Many modern filmmakers move the camera to create kinetic energy, whereas if you have someone like Uwais, you set up the frame and let him dance within it, bringing his own incredible style to bear. It's why we fell in love with him (and Jackie, and Li, and Adkins, and Carano) in the first place. In the words of Ken Watanabe: Let Them Fight.